One of the most difficult aspects encountered by physicians when they begin with shoulder ultrasound is getting oriented. This is a similar phenomenon that many orthopaedic surgeons experience when they are learning shoulder or knee arthroscopy as residents. Simply knowing which way is up or down, and what exactly you are visualizing can be confusing. When I started performing shoulder ultrasound during my fellowship, I had the same issues. The ability to put the ultrasound images you are seeing in anatomic context is made easier if you compare what you are seeing with something that is familiar to most of us...MRI images. Most orthopaedic surgeons have looked at hundreds of MRI's and are pretty adept at knowing what the are looking at. We can easily identify an axial, sagittal, and coronal cut of the shoulder. The images you get with the ultrasound are essentially giving you the same "cuts" of the shoulder that MRI does. If in your mind you are able to say "this ultrasound image is just like a coronal cut on the MRI", you will have an easier time understanding what you are looking at. This is a coronal MRI cut of the shoulder. It is as if you are looking at the shoulder from the front. Note the insertion of the supraspinatus at the greater tuberosity at the left. Compare this to the ultrasound image below. This is the equivalent ultrasound image as the coronal MRI cut above. The ultrasound image gives greater detail to the superficial structures, but you cannot see the entire shoulder like you can on the MRI. The greater tuberosity is to the left and the cuff insertion is seen in great detail. This is an axial MRI cut of the shoulder. It is as if you are looking at the shoulder from above. Anterior is to the top and posterior is the bottom of the image. The bicipital groove and the biceps tendon are at the top of the image. The subscapularis tendon is also visualized well. This is the equivalent ultrasound image of the axial cut above. note the greater detail seen here compared to the MRI. The biceps is seen in the groove with a small amount of fluid surrounding it. The transverse ligament is seen as well. 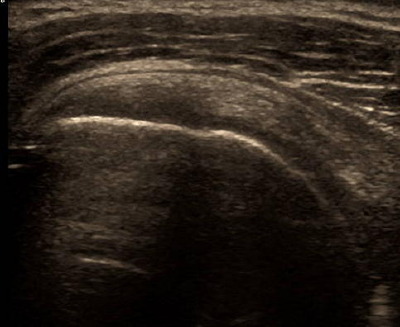 There are two important aspects of shoulder ultrasound. The first is performing the exam correctly so you are visualizing the structures of interest, and the second is accurately interpreting what you are seeing...making the proper diagnosis. Both can be difficult for the beginner. Learning basic exam principals and techniques from the beginning will speed up the learning curve and shorten the time needed to feel confident in your ability to perform an exam and interpret what you are seeing correctly. Remember, you are the expert in musculoskeletal anatomy. You have examined the patient and likely will know exactly what you are looking for during the ultrasound exam. Often times, based on the patient's history and physical exam, I already know what I am going to see on the ultrasound exam before I even begin! In the following tutorial, I will go over the basic shoulder exam technique, and include normal findings of the rotator cuff, biceps tendon, and AC joint. I have put corresponding images next to the pictures of the probe placement to give you an idea of what you should being seeing during each step of the exam. I show a plethora of images with pathologic findings, such as rotator cuff tears and fluid collections. 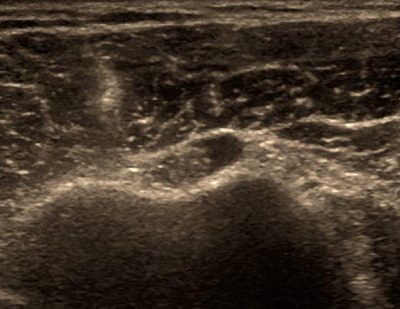 I have also included a section on ultrasound-guided injection of the subacromial space and glenohumeral joints as well as postoperative scans of the rotator cuff after a repair. This tutorial is not meant to be the sole educational experience you should obtain prior to beginning shoulder ultrasound, but should serve as a basic primer to get yourself oriented to the fundamentals of the exam and common findings. I strongly encourage you to attend one of my courses, spend a day performing one-on-on or small group training with me, and practice a lot prior to implementing shoulder ultrasound into your office.